I bet most of you saw this one coming (well, if you follow me on Instagram, for sure!). 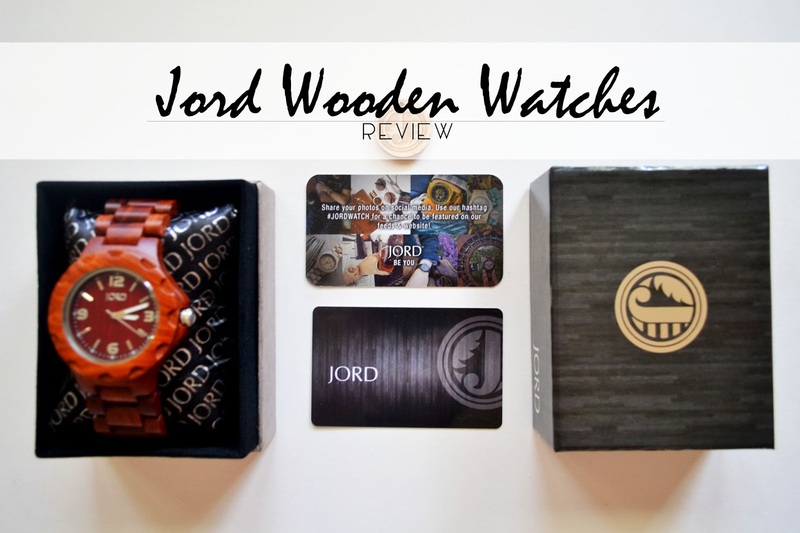 Jord watches have been making the rounds lately, and I was lucky enough to get to review one as well. For some background information, Jord is a Swedish word meaning "earth, soil, land." It's a fitting name for a brand that strives to show off their style that's guided by a deep appreciation for natural elements and modern design. 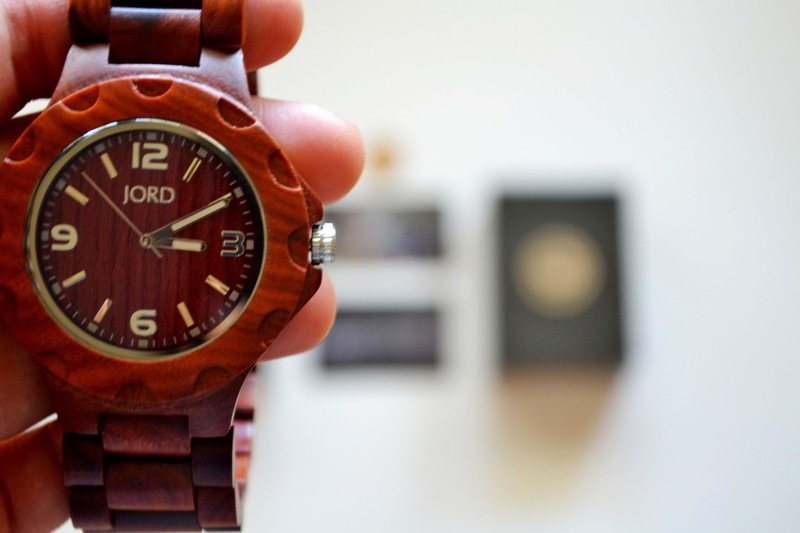 Wood is not just a component of their watches - it's the main feature! When I unboxed this watch, I may or may not have gasped out loud. Seriously, this is one high quality piece of craftsmanship. The smooth finish, rich red color, and attention to detail takes this watch above and beyond the rest. All in all I am seriously impressed by this watch and love how it looks! If I had to compare it to my MEKU wooden watch...well, there's no comparison. This baby is bolder, richer, and exquisite. Not to demean MEKU by any means! I'd say if you didn't want to invest as much in a quality watch, try out MEKU. If you're ready to own a grown up piece, take a look at Jord's selection. Each wooden watch comes with a 12 month warranty - so you know you're the owner of a serious watch if it comes with that! They guarantee that it will arrive in flawless condition and (when treated well - don't go flinging your watch against trees to test it's strength or something) will continue to be just as amazing as when it first arrived. What do you think of this statement piece? 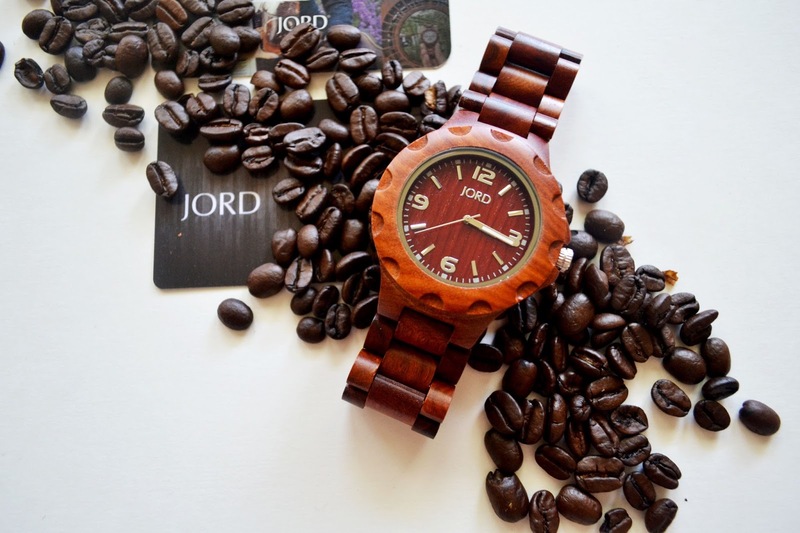 Would you try Jord's wooden watches? "Sustainable, efficient, simple, and influenced by experiential living. Jord owners don't just have somewhere to be, they have somewhere to go. We believe our watches tell more than time." I super loved how you styled it! It looks so good! Ah Linda, that color of the watch is perfect for you! The red really suits your style--so bold and classic. Perfect that you put it next to the coffee beans. 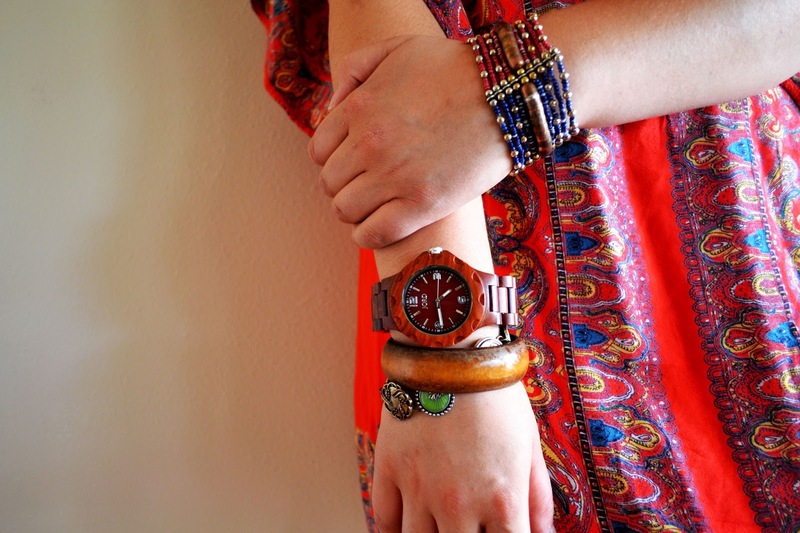 I really love the wooden watch options - such a earthy yet classic look! ooh coolness. i've seen those watches around, i really think their rad! Lucky you, Linda. I am just about to prepare my JORD post, too! Oh my, these are so cool! Love the way you accessorized yours with the earthy, tribal details.